Welcome to our on-line digital drivetrain catalog offering discounted automotive, light, medium, heavy-duty truck and off road parts and accessories. Scroll down to see complete line of products we offer. Purchase your products at drivetrain.com and receive free telephone technical support! Our site is designed to be like a trip to the local auto parts store, you go behind the counter, and search la arge catalog data base, below you will find an auto part catalog index where we present links to our professional quality products for your vehicle maintenance, appearance improvement, economy improvement and improved safety. Open the large stack of catalogs on the counter, by selecting a category below, links with lead you to detailed vehicle application information that you can review and select from. In addition we provide an extensive set of installation instruction and reference information page. Below you can see a graphic picture of each catagory of parts for light and duty vehicles we offer, below that you can see a brief description of each catagory. We also provide links to our Heavy Duty 10 and 18 wheeler products. Our products are supplied by quality manufactures including Dana, Spicer, Rockford, Perfection, Midwest Gear, Foot Axle, Air Locker, ARB, Auburn Gear, Powertrax, Superior, Detroit Locker, Remco, Neapco, Gear Vendor, US Gear, Rockford, RoadMaster, Eaton, Mag-Hytec, American Eagle, AFe, Old Man Emu, and Crown just to name a few. In addition to our warehouses we offer installation and service on all under vehicle components and assemblies, when your in Reno Sparks Vegas, Nevada look us up and let us share our experience and capability with you. As a worldwide warehouse distributor of automotive parts, we hope you enjoy your visit to our site. Over/Under Drive 20% more fuel! 4 x 4 Off-Road Transfer case, rear ends, front ends, all axle components anything you may want to service your four wheel and off road needs. Custom manufacturing is our specialty. Motive Gear, Auburn, Dana/Spicer, Air Locker, Detroit Locker, Warn Hubs, BCA, National Seals, Moser Axle, and OEM replacements. Active Suspension Improve vans, pickup trucks and SUV's road handling, improve load carrying ability and improves you vehicle safety. This product also helps to prevent axle wrap and wheel hopping saving component life. Air Lift Air Bag Suspension Springs that you can adjust air pressure to compensate for your load condition. Ensuring that your load is balanced and level for better comfort and control. When your load increases, you just add air...it's that simple. Air Locker Positraction These Air Lockers break new ground, giving you and instant and full locking differential system - at the push of a button. ARB driver controlled quality positraction. Axle and axle replacements Replacements for your vehicles OE axles Quality parts, even some axles available for older GM and Ford cars! Axle, Heavy Duty Truck replacements Replacements for your vehicles OE axles Only Quality axles for Dodge, Ford, GMC, Mack, Navistar and truck that have Eaton or Rockwell differential units. Bearing Kits Differential rear end bearing kits, include complete overhaul components, bearings, seal and shim, etc. Only High Quality BCA, Nichi, Koyo, Timken, Federal Mogul and Victor Seals. Chevrolet Truck or SUV Gas Performance Kit Take charge of your late model GM pickup truck or SUV's performance. Diesel programmers also available. Gain as much as 65 horsepower and up to 6 more miles per gallon in fuel. Hand held program and air intake system. Chevrolet Truck Parts & Accessories Aftermarket products to enhance and improve your GM pickup truck performance. Exhaust systems, air systems, positraction's units, overdrive and many other products. Clutch Kit Rebuilt clutches may be OK, until you have to replace one, our new OEM clutches have a 12 month, 36000 mile warranty, the High Perfection Power Torque, matched sets provide superior performance. You can purchase at jobber! Clutch Kit Heavy Duty High Performance Clutches for Dodge Ram and Ford PowerStroke Applications, don't settle for OEM performance. Quality New Clutch assemblies required to handle the torque loads of high performance Diesel Pickup Trucks. Coil Springs A complete line of Old Man Emu products for Off-road vehicle applications. Old Man Emu shocks and springs are engineered to work as integrated components of a complete suspension system. Driveline & Axle Disconnects Ideal for towing vehicle behind your motor home with all four wheels on the ground, i.e. no dolly to store! REMCO high quality towing products. Driveline's & Driveline Components and Parts Standard driveshaft components, including slip, flange and weld yokes, ujoints, stub shafts and center bearings. We offer only top quality drive shaft components by Dana/Spicer and Neapco. Supply the parts, get better parts and save money. & Drive Shaft Repair & Manufacturing Facility Standard drivetrain repair services in Reno Sparks, 30 years experience visit our facility or send us the driveline we can help and save you some money. Providing only the highest quality repairs and new replacement drive shaft fabrication service. Using Dana Spice, Neapco and Rockford components. Differential Covers When You're Pulling a Serious Load Quality Aircraft Aluminum, more fluid equals more cooling and longer pinion and carrier bearing life. Differential Rear End Assemblies Complete rear and front end differential assemblies including brakes. Custom manufacturing of differentials to meet individual or production requirements. Quality take outs, new or near new assemblies at very low prices. Chevy/GM 12 bolt, Chevy/GM 14 bolt and Ford 9.75"
Differentials Custom & Production Complete rear end and differential manufacturing facilities! Specializing in Ford 9" for Jeep applications, GM 12 bolt to replace 10 bolt car diff's. 14 Bolt truck to replace 10 bolt 8.5 for better performance on and off road. Have a Nissan/Toyota and cannot get performance positraction's we can build you a stronger replacement Ford 8.8". Differential Ring Gear & Pinion Sets Gear sets, ring-gear and pinions. See gear ratio application and information guide for selecting proper ratio when changing to larger tires. Larger tires can rob performance! 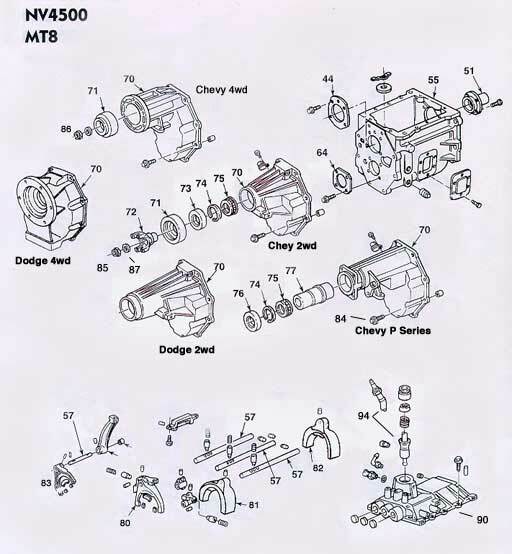 Application guide by differential model, i.e., GM 10 Bolt, Ford 9". Detailed parts listings, find the parts you need with pricing information. Dodge Ram Truck Parts and accessories for your RAM Quality after market performance improvements! Dual Mass Flywheel New OEM Dual Mass Flywheels for Diesel Pickup Trucks. Quality Perfection performance improvements! Exhaust Brake Models to fit exhaust systems from 2.5" to 4.0". Ideal for 3/4 & 1 ton pickup trucks that tow. US Gear Quality Components, take the excitement out of down hill towing! Cat Back Diesel Exhaust 4 inch stainless steel system improves performance. Keep Diesel engines operating within the specified operating temperature. Systems also available for gas vehicles. Exhaust Manifold, Dodge Diesel Replace single piece design and increases exhaust gas efficiency helping to spool up the turbocharger sooner with less exhaust back-pressure ATS three piece pulse manifold for the Dodge Cummins. Electric Fan Ford These electric high CFM dual fan kits remove requirement for engine horsepower to turn fan. Flex-a-lite Increase horsepower , torque and gain mileage. Also available low profile fans for Chevy and Dodge. Filter Air, Dodge Ram Diesel 1994-2002 Dodge Ram trucks L6 5.9Lt Cummins TD. Increase power to pull & tow, up to an additional 24 horsepower & increase torque Advanced Flow Engineering (aFe) has developed a new high flow air filter for the Dodge/Cummins pickups. Flywheels OEM replacement flywheels for both domestic and import vehicles Quality Perfection manufacturing, also flywheels for Diesels as well as Gas . FJ Cruiser Toyota Parts - Accessories performance & off road capability improvements plus appearance enhanced Bull Bar HD bumper, air locking positraction, fridge/freezer, air intake system, roof racks, light kits. Ford Truck Parts and accessories for your PowerStroke and Ford Pickup Trucks Quality after market performance improvements! Ford Diesel Programmer Improve Horsepower, Torque and save fuel! Advance programmer puts you in control, adjust critical parameters and monitor critical vehicle parameters! Hose Kit Dodge Cummins Engines High quality Silicone Hose Kit for Dodge Cummins Engines Turbo and Cooling hoses, hand made in America! Hubs, Front Manual Locking Axle Upgrade you automatic locking hubs to manual Warn is the leader in quality hubs, standard and premium are available. Jeep Single Piece Axle Replacements Replace the factory 2 piece axle assemblies and double your reliability, a great do it yourself project. Only Quality Warn parts, kit includes studs, bearings and seals. Conversion kit hardware available. Leaf Springs A complete line of Old Man Emu products for Off-road vehicle applications. Old Man Emu shocks and springs are engineered to work as integrated components of a complete suspension system. Lift/Leveling Kits, Front End Lift Leveling Kits, Front End add height for larger tires. Another quality kit form ReadyLift™ Chevy, GMC, Dodge, Toyota, Cadillac, Hummer, Nissan & Toyota accomodate larger tires. Locking Hubs Front Axle Replace your troublesome automatic front hubs with manual locking hubs. Use our Application guide to see if your vehicle can be upgraded. Warn pioneered locking hubs, these hubs set the industry standard. Positraction FWD Limited Slip GM front wheel drive automatic transmission/differential assembly. Improve your traction for your GM front wheel drive automatic transmission/differential assembly. Positraction Limited Slip Auburn These limited slip differentials give you the performance gain you need! Put all drive wheels to work, get ready for the bad weather, don't get stuck again! Positraction Limited Slip Eaton Performance limited slp positraction units for Street Performance, Hot Rodders, Off-roaders, and Drag Racers Made from high-temperature carbon fiber wrapped with a carbon anti-wear coating, quiet operation over the life of the vehicle. Positraction Electric Solid Locker Eaton Positraction on demand, just push a control switch Eaton's latest high quality solid on demand positraction for Chevrolet and Ford's. Positraction no-slip Differentials New improved design provides needed traction without the noise of other traction systems. Wondering what differential your vehicle has, you can find out here! Our Application guide allows you to select the locker for your application. Positraction Lockers, Lockright Differentials Provide additional traction for your Auto, Pickup Truck, SUV or RV Differential lockers can prevent you from getting stuck in mud, sand or snow. Only Quality parts by Powertrax --Put both of your rear wheels to work! Great for Off Road applications. Rack & Pinion Assemblies Replace worn or leaking assemblies. These high quality remanufactured units by Universal Mfg. will improve safety and improve tire life. Ring and Pinion Gear Sets Optimize your differential ratio to improve performance and save money. Stop giving your money to the oil companies, if you are not towing with your pick;up truck. Application guide by differential mode. Matched ring gear and pinion sets high quality gear grinding. Steering Gear Box Manual Steering Gear Box, Power Steering Gear Box Remanufactured, high quality for for longer life. Tools Dial Indicator and Magnetic Base Required for setting up ring and pinion back lash measurement. Tow Bar & Base Plates If you tow a vehicle you need a state-of-the art tow bar and base plate! Demco equipment, we offer the latest in towing accessories, Aluminator, Excali-Bar & Kwik-tow. Roadmaster towing equipment available. Tow Brake Unified Tow Brake with both Proportional and Progressive Braking Improve Safety by utilizing the towed vehicle's own power brakes. Required by many states. Chevy & General Motors, Dodge, Ford, Jeep and Imports Improve the reliability of your off road vehicle with these factory remanufactured unit with 12 month warranties. Most lubricant manufacturers make a small number of automotive products, maybe three motor oils, two gear oils, a grease, and an ATF. All applications have to fit one of these universal products. Unfortunately, the automotive world is not quite so simple. And even if one of these compromise products works, perhaps a product formulated with the intended application in mind might provide a few percent better power, efficiency, or lap times. Red Line Synthetic Oil Corporation has the most complete line of automotive lubricants available. Red Line realizes that reducing friction is necessary in a rear differential, but that friction is actually necessary in a transmission so that synchronization may occur. No lubricant can do a perfect job for both. The same is true for engines. Reducing friction is a goal of engine lubricants, but the detergents used in most motor oils compete with the friction reducers for the metal surface. So if you want the lowest friction, use an oil formulated for the lowest friction. Red Line manufactures Racing Oils which contain few detergents, so no compromise has to be made. First we will discuss motor oils. Most motor oils are designed to lubricate three test engines - a Ford 4-cylinder, an Oldsmobile V-6, and single cylinder Caterpillar diesel. Oil formulations are optimized to adequately lubricate these engines, but not so well that a lot of money is left on the table - the motor oil shelves are very cost competitive. These oils will adequately lubricate most automotive engines, even many high-performance engines, because the manufacturers know that the highway patrol will catch you before high-speed operation can cause significant damage. Now take these products to the track and all bets are off! Try an endurance race with the 5W30 oil that the manufacturer recommends. Well, maybe before you try it you ought to take a survey of engineers who work for the auto manufacturers to find out if any of them would even use these "Fuel Economy" oils for their own passenger car during the summer. Red Line lubricants work under the demanding conditions of high-performance driving. Red Line has been manufacturing high-performance synthetic lubricants for over twenty one years. During the earlier years many would say, "Well, if synthetics are so good, why doesn't the Brand X Oil car use one. Well, now we find that the Brand X team was using synthetics for years (maybe even Red Line) and that many of the major oil marketers now sell synthetic lubricants in an attempt to keep up with technology. Synthetics as a class of lubricants have some significant advantages over even the best petroleum lubricants. The first advantage is being able to manufacture multigrades that will provide excellent high-temperature and high-speed performance. In order to manufacture a multigrade petroleum, say a 10W30, a 10W oil is thickened with a polymeric plastic substance much like STP. This enables the oil to flow like a 10W oil when cold, but appear to be an SAE 30 when measured at the high temperature (100 degrees C). The problem is that the high temperature testing is done in a tube at the equivalent shear of a very low RPM. At high RPMs a 10W30 multigrade petroleum will appear to have a viscosity between a 10 and a 30 and at very high RPMs the viscosity will be a 10. A synthetic generally does not thicken as much at cold temperatures or thin as much at high temperatures as a petroleum oil, so large quantities of unstable thickeners are not required. The advantage is that at high RPMs and high temperatures a synthetic 10W30 can actually provide thicker oil films than a straight SAE 30. However caution must be advised when thinking about synthetic 5W40 and 5W50s. Here significant amounts of the thickeners used to make petroleum multigrades must be used so that the high-shear viscosity will provide the equivalent to a petroleum SAE 40. This chart shows how the viscosity of a lubricant varies in the different shear zones of an engine. The superiority of synthetics lies in the fact that a 10W40 synthetic can provide the high-shear protection superior to a petroleum 20W50 in the bearings and cams, while providing a much lower viscosity on the cylinder walls and in the ring pack. This lower viscosity produces more power and also better efficiency and fuel economy. However, wide range synthetics such as 5W50s use the same thickener systems as petroleum 20W50s and suffer from the same viscosity losses in the bearings and cams. The viscosity characteristics is where the similarities of synthetics end. Not all synthetics are created equal. If metal-to-metal contact does occur, the amount of friction created can make a great difference whether the bearing will spin or the cam and follower will create tremendous heat and wear. This chart indicates that Red Line lubricants provide significantly lower friction. Compared is Red Line with several "high-performance" synthetic and petroleum lubricants. This reduced friction means less heat is generated, so temperatures are reduced, wear is reduced, and more power is transferred to the wheels. Another significant property of Red Line is the stability of the oil with use. Note that after 15,000 miles Red Line produces less friction than the other popular synthetics when new, and some formulations are very weak in friction properties with use. Red Line lubricants also excel in wear protection. Red Line provides several different antiwear additives in each lubricant to provide wear protection over a very wide range of conditions. The data from two ASTM wear tests below indicate that Red Line has a distinct ability to carry a greater load (film-strength), and that less wear is produced per unit of load. Across the range of loads which your automotive equipment can encounter, Red Line can provide less wear and a much lower chance of catastrophic failure than other petroleums and synthetics. This can make the difference between an engine saved and one which is destroyed when a mechanical component such as a connecting rod bolt breaks. Red Line also will reduce lubricant temperatures significantly. Track testing done by the Delco Chassis Division of General Motors showed a reduction in both engine and transaxle temperatures of at least 30 degrees F when comparing Red Linemotor oil and to a major synthetic brand. These tests were performed in a Oldsmobile Calais and a Chevrolet Berreta GTZ equipped with the High-Output QUAD 4. Another significant difference between Red Line and other synthetics and petroleums is the ability to withstand high temperatures without decomposition. The polyo lesters used by Red Line have a significantly greater degree of thermal stability compared to the synthetic hydrocarbons and petroleum lubricants. In fact, the polyol esters are the only lubricants capable of properly lubricating a modern jet turbine engine. This enhanced thermal stability can provide improved lubrication in the extreme temperature regions such as turbocharger bearings and upper ring area, provide improved cleanliness, and allow extended high-temperature operation. The chart above compares the ability of several synthetic and petroleum lubricants to withstand decomposition at a temperature of 500 degrees F for three hours. The reduced friction, lower wear, and increased thermal stability all indicate a product which is superior to other commercially available petroleum and synthetic lubricants. This translate into improved protection and more power to the wheels. For example, Boris Said has won the SCCA SSGT class for three years straight using Red Line lubricants in his Camaro with a 305 Chevy V-8. This car has over 7,000 mile of sprint racing on it, all with the same drivetrain components. The engine is taken apart every year, new bearings are replaced simply as a precaution, not because they are damaged. The original rings are still in the engine and there is no evidence of wear on the rings or cylinder walls. This car has been incredibly low-cost to maintain. Boris can without a doubt attribute his victory to Red Line Oil. During the championship race his power steering hose broke on the first lap, pumping all of the fluid out of the system. Pumps aren't made to last 45 race miles without fluid. Pump seizure was a certainty which would have put him out of the race. But the pump never seized with the remnants of Red Line Power Steering Fluid in the system. Another example is Wayne Torkelson, the owner and driver of the first Ford doorslammer to ever reach 200 mph. Wayne competes in the IHRA Pro Mod circuit with a blown alcohol '55 Thunderbird. As soon as Wayne switched to Red Line Gear Oil he picked up 1.5 mph on the top end. Previously he had been wearing out a ring and pinion every 20-25 passes. Since then he has yet to wear out a ring and pinion in four years. Prior to switching to the motor oil, he would get 3-4 passes on a set of oil rings. Now he gets 85 passes or more. In fact, if the engines have no breakage problems, he can run a whole season on the same rings and 40 passes on a set of bearings. A National Record Holder in SS/DA, who races a '67 Corvette Coupe with a 427/Powerglide combination, one day switched to Red Line 30WT Race Oil and LightWeight Gear Oil and picked up seven hundredths. It would cost thousands to pick up that much with engine work. After 50-60 passes the motors are disassembled and the internal components look perfect - bearings, rings, cam, and cylinders. Jim Jones, the owner of Traco Engineering, has built 350 V-8 motors for Corvette endurance racing for years. His engines are run by different teams using different oils, many of them other synthetics. He will get engines back from the different teams after a 24-hour race. All engines ran at the same track and have the same number of miles, but he can always tell the Red Line engines from the others. The difference in wear is incredible. The most noticeable difference is in the valve guides. After 24-hours operation on other synthetics they are completely worn, while with Red Line they are still in good condition. Dyno tests have shown Red Line to provide between 1-3% improvement in power. In a 460 big-block Chevy at 5500 rpm and 175 degree F oil temperature, a petroleum SAE 30 race oil provided 526.8 hp while the Red Line 30WT Race Oil provided 534.4 hp, and increase of approximately 1.5%. Greater differences are usually obtained if the temperatures are higher because of the better viscosity at high temperatures. Red Line manufactures a cooling system additive called WaterWetter which is capable of reducing the coolant temperature of a high-performance vehicle by 15-30 degrees F and can provide even greater reduction in cylinder head temperature which means greater volumetric efficiency and allows more spark advance. WaterWetter also provides rust and corrosion protection in plain water which can provide additional cooling efficiency compared to antifreeze. We provide a complete line of automatic transmission parts, overhaul kits, troubleshooting and overhaul guides to factory remanufactured automatic transmissions. Shift kits are available, and more importantly shift enhancement kits are available, these enhancement kits fix know problems with automatic transmission. Enhancement kits correct design and manufacturing defects, yes they can be corrected after your vehicle has left the factory. If there is an enhancement kit available for you application be sure you have one installed before your transmission suffers costly failures. Remanufactured transmission are available with 12 month, 36 month and 60 months available for our standard automatic transmissions that are all dyno tested by experience factory technicians before they level the factory. Heavy duty automatic transmission are available for Chevrolet, Ford and Dodge applications to support utility and towing requirements. Considering have your existing automatic transmission overhauled or replaced, just ask your mechanic three simple questions; first, how many hours will it take him to remove and replace the transmission in your vehicle. Second ask him what his hourly shop rate charge is. The last question is to inquire as to how much it will cost for him to supply and replace your transmission (this will take a minute, he might even have to call you back). Armed with this information call us and check your cost, compare the savings and order the transmission. If you make the arrangements with your mechanic we can even ship the unit direct to his shop. Below you will find links to detailed automatic transmission applications, parts, cross reference information answering the question what automatic transmission do I have? All this information to assist you in quality vehicle maintenance. Routine maintenance and repair will save you money! Remanufactured Automatic Transmissions chart. See application guide. Enhancement kits correct design and manufacturing defects, yes they can be corrected after your vehicle has left the factory. If there is an enhancement kit available for you application be sure you have one installed before your transmission suffers costly failures. In this section of our parts catalog you will find detailed information and links on Clutch kits, some master and slave cylinder also information and links to detailed application guide and list of flywheels that we offer to assist you in repair of your vehicle. A wide range of information is provided to assist you in avoiding clutch failures. And a 14 step series is present to assist you in troubleshooting clutch failures. We offer a wide range of flywheels for both domestic and import vehicles including flywheels for Acura, Dodge, Ford GEO's, Honda, Isuzu, Mazda's Mitsubishi, Nissan, Pontiac, Saturn's Suzuki and Toyota. When changing you clutch be sure to inspect the flywheel, it's a good idea to always have your flywheel replaced. The flywheels we supply are only the highest quality flywheel manufactured and are direct factory OEM replacements. All flywheels are built and tested to OEM specifications. See automobile and gas pickup Flywheel application guide. Detailed information on Heavy Duty Diesel Pickup Clutch kits Chevrolet GMC DuraMax, Dodge Ram Diesel, Ford PowerStroke Diesel from stock duty clutch size upgrade, heavy duty and competition up to 950 horsepower is provided to assist you in identification of the clutch kit to meet your horsepower and torque requirements. Application information is also available for replacement of dual mass flywheels for your Chevrolet Dodge and Ford diesel applications. Clutch Kits, Automotive and Gas Pickup Trucks - Power and Torque POWER TORQUE NEW O.E.M REPLACEMENTS SET, The Best of Both Worlds - In One Clutch Line! We feature standard better than OE performance Power Torque clutch assemblies, matched sets of pressure plate and disk, quality made components. We off a complete line for the following vehicle manufctures': Acura, Audi, BMW, Buick, Chevrolet, Oldsmobile, Cadillac, Suburban, Tahoe, Blazer, Toyota, Nissan, Lexus, GMC truck, Pontiac, Chrysler, Dodge, Plymouth, Eagle, Ford, Ford truck, Geo, Honda, Isuzu, Jeep, and Mazda. We offer a wide variety of clutches to meet most applications, select from the following application guides to identify your clutch replacement. for your application, Horsepower & Torque! Chevrolet DuraMax Dodge and Ford Diesel Pickup truck clutch kits. Below you will find links to you indivicual application, information on clutch failures and how to avoid them, and a detailed section on diagnosing clutch problems. Clutch Failures and How to Avoid Them! Determining the exact part number? It's is easy, after you have removed your old clutch, measure the clutch disc diameter, count the number of spline's and measure spline diameter. The following description example is supplied to assist you. Description "7 1/2-19-13/16" is 7-1/2" disc diameter, 19 spline with a 13/16" spline diameter. Welcome to the Drivetrain section of our parts catalog, here we present information on a number of rear end differential related parts and upgraded differential assemblies to improve your drivetrains performance. Having vibration problems caused by worn or damaged drivelines or just need driveline/driveshaft parts you will find links here to the driveline driveshaft parts, replacements shafts and a link to our manufacturing and repair shop in Reno Sparks. detailed information and application guides. We offer a complete line of heavy duty 10 and 18 wheeler truck drivetrain components including center bearings designed to last. American made differential axles and Professional Bearing Gasket Seal kits for overhauling large heavy duty transmissions. Put the fire back in your vehicle our custom designed power chip and programmers are specifically programmed to enhance your vehicles performance, available for Ford gas and diesel vehicles. Electronic performance enhancing circuits also available for the Chevrolet and Dodge Ram Cummins. Our Ford programmers that change parameters which control the engine's air/fuel mixture, timing, turbo boost (diesel), and the automatic transmission performance. When towing a heavy trailer you will need the added performance provided by these programmers. For the early 12 valve Dodge Cummins the Cam plate is a mechanical part that you easly install in the fuel pump and provides WOW performance. The shortcomings of the new electronic-controlled engine is the fine-tuning of the fuel injection system, now, through the miracle of advanced microcircuit electronics, drastic horsepower improvements are possible with the aid of computer software. That's where our new programmers enters the picture, automatic transmission shifting points are improved and speed restrictions are removed. Whopping rear wheel horsepowerincreases! Some fuel economy improvement, some customers claiming 6MPG we believethat 2 to 4 is normal! Outrageous acceleration! Follow these links to find additional information on performance enhancements that are prossible. This is definitely a (DIY) do it yourself project that can be completed in less than 60 minutes. Positraction Units, don't get stuck again! We offer a wide selection of positractions to meet your specific application, why you need a positraction unit, when your vehicle is negotiating a corner, the outside wheel has to travel a grater distance than the inside wheel. Therefore, the outside wheel must turn faster than the inside wheel. The differential is the device within the axle assembly which, in addition to transmitting the power to each axle shaft/wheel, allows one wheel to turn at a different speed than the other. Conventional differential uses two side gears inside the differential case. Each gear is splinted to accept an axle shaft. These side gears are in turn driven by a set of spider gears. The spider gears, also inside the differential case, ride on a shaft which is pinned into the differential case and through which all the power is transmitted. The case is driven by the ring gear that is bolted fast to the case. The conventional differential is fitted as standard equipment on most vehicles. On paved roads this system is very successful, giving predictable handling, even tire wear and requiring very little maintenance. However, in off road situations where traction surfaces vary greatly, this type of differential has a major limitation. When one wheel has greater traction than the other, all the power will be directed to the wheel with the least traction. Limited slip differentials (LSD's) come in a variety of designs. Most use friction plates, cones and/or gears to reduce slippage between each of the tires. these units have a dual power path from the differential case to the axle shafts. Some power is transmitted through the spider gears to the side gears in the conventional manner. The remainder is transmitted by friction between the differential case and the clutch plates and the side gears. Automatic locking differentials transmit power to each wheel through a pair of dog clutches. Differential action, such as when cornering is provided by automatically disengaging the appropriate clutch when one wheel rotates faster than the other. This results in differential action, that occurs in ratcheting stages rather than being smooth and progressive. Power received by the differential is automatically directed to the wheel with greater traction. Manually lockable differentials use a conventional differential in conjunction with a mechanical locking device that can be operated at the driver's discretion. when locked, both axles will then turn at the same speed irrespective of the road surface. When it is unlocked, the differential functions as a conventional differential giving predictable handling, long service life and no increase in tire wear. The Electric or Air Locker unit incorporates its activating mechanism totally inside the differential center. This avoids the need to have complicated piston arrangements hanging off the axle housing. Locking action is controlled by the drive with a push button switch inside the cab. Save fuel by optimizing differential ratio to your specific vehicle application! If you have changed tire diameter optimize your vehicles power by changing differential ratio. Gain back the lost power! Free Tech Support! Considering purchasing parts and have questions call toll free 1-800-216-1632 and talk to an experienced technician. We feature Ring Gear and pinion sets, for General Motors, Chevrolet, Ford, Chrysler and Toyota. We are a Dana Distributor and supply genuine DANA-Spicer ring and pinions, and differential parts from only the highest quality aftermarket manufactures. We can supply ring and pinion and differential parts for: American axle, AMC Model 20, C-5 Corvette, Dana 30, Dana 44, Dana 50, Dana 60, Dana 70, Dana 80, Chrysler 7.25", Chrysler 8.25", Chrysler 9.25", Ford 7.5", Ford 8", Ford 8.8", Ford 9", Ford 10.25 and Ford 10.5 . Parts are available for the following General Motors Differentials: GM 7.5", GM 7.625", GM 8.20", GM 8.5" 10 bolt, GM BOP, GM 8.875" 12 Bolt, GM 9.5" and GM 10.5" 14 Bolt. We can also provide differntial parts for Toyota 7.5" and Toyota 8" . Dodge 8.25" and 9.25" ring and pinions are provided. Don't see what you need just give us a call. Posi-traction units by Eaton, Tru Trac, Powertrax , Detroit Locker, Air Locker, and Auburn Gear as well as factory units and repair parts. Complete third member assemblies as well as locking and limited slip differentials are available. We also offer axles, open and posi carriers, spools, wheel bearings, gaskets, seals and spider gear internal kits for complete installations along with top quality bearing/overhaul kits, driveshafts, yokes, u-joints, u-bolt & strap kits and other differential parts. Below you will find links to various manufactures differential application guides and parts list. You will also find links to our popular custom differential assemblies, gear ratio verses tire diameter information. A Link for set up procedure for differentials. Installation instructions are provided, order your ring and pinion kits from drivetrain.com and receive direct access with technician to assist you with setup procedures, links to various positraction units and other technical information to assist you is also provide. We specialize in matching your tires and axles with the desired differential ratio's, we have a wide variety of gear sets in stock and can recommend and select the best suited differential for your driving application. We will recommend the right gear ratio to match your engine horsepower, transmission specifications and tires that you may have selected. Thinking about changing tire size we can help, consult our Look up chart for determination of engine RPM, gear ratio and tire size combination. Larger tires on lifted truck suffer from loss of power, changing the ring gear and pinion to a lower ratio is the answer. Light duty series designed for every day street performance. Performance series, designed to meet the high performance requirements of the racing world. Custom and Production differential products. 12 GM Car replacement upgrade for 10 Bolt muscle cars. Chrysler 8.75" Ring Gear and Pinion Sets What Chrysler Dodge rear end ratio may I have? Dana 60 Ring Gear and Pinion Set Dana 60 Carriers, Internal Kits, Positractions etc. Dana 35 Ring Gear and Pinion Sets Dana 70 Ring Gear and Pinion Set Dana 70 Carriers, Internal Kits, Positractions etc. Dana 44 Ring Gear and Pinion Set Dana 80 Ring Gear and Pinion Set Dana 80 Carriers, Internal Kits, Positractions etc. What Ford rear end ratio may I have? What General Motors rear end ratio may I have? LandCruiser Front IFS 8.0" LandCruiser Rear 9.5"
Installation instruction sheet for Ring and Pinion gear installation. Spanish installation instruction sheet for Ring and Pinion gear installation. Positraction differentials ensure maximum traction under adverse conditions, they are designed to keep both wheels in a constant drive mode, with the ability to automatically "unlock" to permit necessary wheel speed differentiation. It also eliminates individual wheel spin for better traction and less tire wear. Other Formulas that might be useful! See our new 12 Bolt Car conversion for GM 10 Bolt 8.5" muscle cars. We off a complete line of both manual and power steering pumps these are remanufactured in a factory each unit receives all new bearings, gaskets and seals each unit is tested prior to shipment, follow links in this section will provide information on units available for your application. In addition to the steering components we offer here we also coil and leaf springs and shock for many four wheel applications.. These quality products are manufactured for us by ARB one of the leading manufactures of heavy duty well engineered off road components. Engine and transmission mounts are available to replace worn or damaged mounts. It's important to check and change these mounts as they are some times damaged, this will cause the engine or transmission to move out of alignment which can lead to vibrations that will damage seals causing loss of fluid and further expensive maintenance costs. Find Leaf springs for your application. Our dial indicator and magnetic base kit is essential to proper setup of the ring and pinion back lash measurement, when setting up you differential. Towing Experts - Worry free towing! When you are getting ready to tow you will need the following items, some way to disconnect the transmission while under tow. For vehicles with front wheel drive we offer the Lube Pump and in limited cases the drive axle disconnect is available. A baseplate to attach to the towed vehicle's frame, a towbar to connect baseplate to the motor home or tow vehicle. Also required are safety cables and lights. In some states you will also need an auxiliary braking system. We provide only the highest quality towing products including Lube-Pumps and Axle Locks for the following vehicles: Acura Honda, Buick, Cadillac, Chevrolet, Chrysler, Dodge, Ford, Lincoln, Mercury, GEO, Suzuki, GMC, Isuzu, Nissan, Oldsmobile, Pontiac and Toyota's. Below you can find links to each of these products with detailed application information. Towing your vehicle behind a motor home has now become very common and most motor home owners report that towing a car has little or no effecton handling and mileage. Yet many questions remain about towing with all four wheels on the ground verses using a 2 wheel dolly. Owners agree that towing with four wheelsdown is the safest way to tow. Rebuilt Replacement Transfer Cases for Chevrolet, Dodge, Ford, Jeep and most Imports are also available! Below you can find a detailed list of transfer cases by vehicle model that we supply overhaul kits and repair parts for, following these link will provide detailed list of parts for your transfer case. Factory built and test, our Transfer Case Units unlike many lower quality rebuild transfer cases, these units are re manufactured Transfer Cases that we offer have been thoroughly tested from the smallest piece to the completed assembly. Low service expectancy parts are automatically replaced regardless of their condition. All other parts that do not have absolutely new potential service life are replaced with the highest quality parts available. Improvements (upgrades) are performed to improve on the manufacturer's design when possible. But these procedures alone will not guarantee you the highest quality transfer case. It is the experience of the crafts people with their knowledge, dedication and uncompromising desire to improve that makes our remanufactured transfer cases the standard of quality in the industry. No hassle warranty. Is someone offering to rebuild your existing transfer case wondering what the difference is between rebuilt unit and re manufactured unit? The person offering the rebuild service gives you a price typically without opening up your transfer case. He is betting that he can fix the unit with minimum expense for parts and get you on your way without a warranty! Re manufactured units have more new parts and come with a 12 month warranty. Another thing to consider is that it takes less mechanical skills to remove and replace a complete unit than it does to rebuild a unit if you are considering doing the job yourself also less time. If you have good mechanical skill and time rebuilding your existing unit is recommended. Professional bearing rebuild kits plus hard parts are available. So the next time you need a transfer case remember - all transfer cases are not the same - you can never make a bad decision by choosing the best. Great Value! 12 month, unlimited miles no hassle warranty! We provide professional quality transfer case parts and rebuild parts kits that are designed to be top of the line overhaul and transfer case repair kits. We have included information on how to identify individual transfer cases by, application information, model year, and detailed kit and part availability by transfer case type. In most cases we also provide a free-detailed parts illustration to assist you with part identification and re-assembly. To have your transfer cases last longer be sure to balance both front and rear drive shafts when installing new transfer case. Providing your assembly number will ensure that you receive a direct drop in replacement. Tahoe GMC Jimmy Grand Cherokee Nissan Pickup Transfer Encoder Motors are sold separately. V Series GMC K Series 1500 Grand Wagoneer Oldsmobile Bravada Transfer Case Encoder Motors Chevrolet, GMC , Dodge, Ford, Jeep & Imports. Below find listed are model numbers for individual transfer cases, following these links will provide detailed application specific quality transfer case parts and rebuild parts kits are designed to be top of the line overhaul and transfer case repair kits. We have included information on how to identify individual transfer cases by, application information, model year, and detailed kit and part availablity by transfer case type. Select your transfer case model number from the following list and see detailed parts that are avaialble. Will not work on 3 bolt tailhousing units. We offer a complete line of rebuilt manual transmissions (RWD) and front wheel drive (FWD) transaxles. A complete line of repair parts and overhaul bearing kits for both manual transmission as well as hard parts to assist you with your repair. Our remanufactured and new transmissions have a 12-month warranty. A complete line of rebuild kits including bearing, gasket and seal kits are available. In most cases we can supply brass syncro-ring kits and many hard parts. In some cases we can provide good used parts to help save you money, just give us a call toll free 800-216-1632 and talk to an expert! Rebuilt manual transmissions are available for the following vehicles: Acura, AMC, BMW, Buick, Cadillac, Chevrolet Car and Pickup Trucks, Chrysler Carsand Imported trucks, Dodge Pickup , Daihatsu, Datsun, Eagle Ford Cars, Ford Pickup and Vans, GEO, Honda, Hyundai, Infiniti, International, Isuzu Cars and Pickups, Jeep, Kia, Lexus, Mazda, Mercury, Mitsubishi, Nissan, Oldsmobile, Plymouth, Pontiac, Saab, Saturn, Suzuki, Toyota, Volkswagen and Volvo. Just a few of the models of transmissions we support include the A578, A560, AX5, AX15, F5M22 and F5M33, W5M33, Getrag HM290, Getrag 360, T5, T5 world class, T14, T15, T18, T45, T56, T150, T19, Toyo Kogyo, ZF, NV1500, NV3500, NV4500, D-50, NV5600 Tremec, Saginaw, Muncie and Peugeot BA-10 and many more. Re-manufactured rear wheel drive (RWD) manual transmissions and front wheel drive (FWD) transaxle units for both domestic and foreign vehicles are available. A complete line of high quality professional manual transmission overhaul/rebuild kits including bearing, gasket and seals are available. Quick Cross reference information is provided to assist you in manual transmission identification using numbers of tag on transmission, cross reference data is provided for Ford truck, Jeep and Dakota applications. Getrag 360 conversion to NV4500 & other NV4500 applications! Here you will find links to the parts we supply by vehicle type. Locate your vehicle make below and you will see all of the featured products we offer. Plus application data, information and pricing. We offer a complete selection of axles and halfshaft for all popular ATV's. In addition to our drivetrain warehouse in Reno Sparks we also have two automotive repair shops. We have a full service driveline driveshaft remanufacturings and assembly shop including a high speed balancing system. In addition we provide drivetrain related repair, overall and custom installation of differential assemblies, ring and pinions, transmission overhaul and installation. We offer an advanced air filter system (some times called cold air intake) for Chevrolet GM Duramax, Dodge & Ford Diesel or GM Gas vehicles this is definetly a project for the DIY Owner. Bolt on horsepower increased performance, save fuel! In some applications remove factory designed intake air difficiency, improve by over 200% engine runs easier and cooler extending engine life. Don't see filter system you need just give us a call. Manual Transmission Parts and Rebuild Kits, used parts are available. Having a problem with your manual transmission? We offer Free Technical Support! Call today and talk to an expert! You can find parts by searching transmission model numbers: Follow this link. Acura, AMC, Buick, Cadillac, Chevrolet Car, Chevrolet GMC Truck, Chrysler, Daihatsu, Dodge Car, Dodge Truck, Eagle, Ford Car, Ford Truck, GEO, Honda, Hyundai, Infiniti, International, Isuzu Car, Isuzu Truck, Jeep, KIA, Land Rover, Lexus, Mazda Car, Mazda Truck, Mercury, Mitsubishi Car, Mitsubishi Truck, Nissan, Oldsmobile, Plymouth, Pontiac, Saturn, Suzuki, Toyota Car, Toyota Truck, Volkswagen and Volvo . Also available we provide a large selection of free manual transmission part illustrations to assist you in correct identification of part and assembly sequences. We also provide a full line of Syncro Ring Kits. Information on how to disassemble a HM290 or NV3500 used by both General Motors and Dodge. Need to know What transmission fluid your should use in your manual transmission? Gear-Splitting Performance and Overdrive Economy for RV's, Trucks, Muscle Cars, Hot Rods, and Racing. We offer the finest quality auxiliary overdrives. Our units are the ultimate in horsepower handling and performance. In this section you will find general information on performance improvement and saving vehicle life by running engine at lower RPM's. Follow the links below and find the application guide for your vehicle. Or you can email or call us at 800-216-1632 for free technical support! Whether you are trying to move a couple tons up a steep incline in your work truck or cruising in your motor home - the fastest way is with the right gearing with one of our gear vendor overdrive units. Add the benefits of our final overdrive ratio to reduce engine rpm and increase fuel mileage by typically 20-28%, bolt on horsepower and economy for your your car or truck. With fuel costs overdrive can pay for itself in mileage and engine wear reductions. View our chart below to find the right overdrive unit for your vehicle. Torque (times) RPM (divided by 5252) = Horsepower (this can be expressed) Tq X RPM / 5252 = HP. Our Gear Vendors Overdrive is one of a few products that can work both sides of this equation for real performance gains as well as consistent fuel consumption reductions. Gears are multipliers of torque and our Ratio Splitting capability allows you to shift to a gear with more mechanical advantage than the next stock gear in automatic transmissions and wide ratio manuals. This also means engine rpm drops about half what it did without this overdrive and so rpm is sustained - higher torque and rpm on shift = more HP. And then shift to an overdrive final and reduce both rpm and torque to reduce the manufacture of HP when steady cruising to improve fuel mileage and decrease wear on the engine and engine driven accessories. All these benefits from Gear Vendors ratio splitting performance, at the same time this ratio splitting makes less work for the main transmission in the vehicle to then advance to the next gear (less ratio change) and thus the main transmission itself becomes more reliable. The unit ships in kit format, lots of detailed instructions, parts and in most case all mounts are supplied, typically installation including electronics takes about 8 hours for a skilled installer. Auxiliary Overdrive Units for Pickups and RV's twice the forward gear ratios. Installed Gear Vendor for 20% better cruising mileage. Installed Gear Vendor for more Power moving landscape equipment trailer. Gear Vendor More Power More Mileage for longhauls. You want more power to climb hills or tow with heavy loads, plus at the touch of a button taller gearing for cruising down the highway with the lower engine RPM's and improved fuel mileage. You'll need an auxiliary overdrive transmission capable of gear splitting. The toughest built best performing auxiliary transmission you can buy is the overdrive from Drivetrain Specialist. 22% overdrive 20% fuel savings, two year warranty rated at 30,000 pounds applications for Chevrolet, GMC, Dodge & Ford AOD transmissions and most beneficial when used in motorhomes. Our overdrive kits are very complete and are designed for your specific vehicle, detailed installation instructions are included in kit, installation is also available. Select your vehicle from the following table to see detailed information on improving your vehicles performance and saving money today! This overdrive gives your vehicle up to twice the forward gear ratios for unparalleled performance. Our overdrive is electronically superior. In older vehicles without computers our simple plug in electronics still provide many features such as AUTODRIVE™ which make your car or truck perform just like it came factory with the overdrive. Those older 3-speed automatics also adjust their shift points automatically because we slow down the governor on the trans whenever the overdrive is on. For you this means the vehicle will not lug and will shift down to a passing gear that is really useful instead of just screaming the engine. In today's computer controlled vehicles we communicate directly with the vehicle so that shift points recognize when you are using the GEAR VENDORS and adjust performance automatically. In either vehicle you can put the electronics in auto and enjoy several features or flip a switch to manual and control everything about the gearing yourself. Take advantage of our 27 years of product development. Each Overdrive auxiliary transmission represents the combined effort and technology of Gear Vendors, Inc. (the largest producer of overdrives in the world). The very finest in manufacturing, assembly, and R&D facilities are available. Our customers ride with confidence knowing that we offer the only auxiliary transmission available that is approved and used by new car and motor home manufacturers. Component quality is unsurpassed, Sheffield steel planetary gear set, 4500 ft. lb. roller clutch, forged ring gear assembly, common vertex (cone) full throttle shift clutch. Can the unit get stuck in neutral? What if the unit loses all its fluid (leak)? Can I shift the unit under any throttle condition (including full throttle)? If a major problem occurs, can I simply shut it off and continue driving? We know the RVer wants a gear splitting/overdrive product that works as well as the rest of his vehicle and can never leave him stranded, period! Price is secondary, Reliability First. Power is certainly the No. 1 reason more people choose the Gear Vendors overdrive. There is no other auxiliary transmission available which can split gears as effectively. In vehicles with automatic transmissions the unit is intended to shift at any throttle position including full throttle and delivers a crisp responsive shift. Shift it as much as you like . . . the internally activated common vertex clutch is designed to last 250,000 miles. Vehicles with manual transmissions also benefit from the constant mesh planetary gear design as both in-shifts and out-shifts are as simple as depressing the vehicles clutch pedal and pushing a button. No syncros to wear out, no grinding gears or mis-shifts possible. The systems sophisticated planetary design has very low friction which means not only will a Gear Vendors last longer, but it's quieter and has less power loss (less than 1hp per 400hp) than any other auxiliary transmission. All Gear Vendors overdrive offer a .78 to 1 (22%) overdrive ratio, designed to be the ultimate gear splitting and overdrive ratio for today's RV's. Anything less than 22% would be less effective at slowing RPM's while cruising in overdrive . . . anything more than 22% wouldn't be effective as a gear splitter when you need power to climb hills or to pass slower traffic. Performance through proper gearing is the cornerstone of Gear Vendors overdrive. There are many devices advertised as remedies for poor gas mileage. Fact is, anyone who tells you how much you are going to gain is just trying to sell you something. Every vehicle represents many different situations, different drivers, different conditions of tuning, different climates and altitudes. The Gear Vendor overdrive is not some magic pill, but twice the number of forward gears for combating all these different conditions. Every time you shift there are such big changes in transmission ratios that your engine RPM's fall completely out of the power range. You need that half gear between each of your current gears which will not only keep the engine making power but improve its useful life and reliability. You'll no longer be overreving the engine in too low a gear or lugging it in too tall a gear. Plus out of the same device get a gear that lets the engine slow down without slowing down the vehicle which not only can save you a lot of fuel, but greatly reduce engine wear. Imagine the same engine work (RPMs) that currently take you 15.56 miles - can take you 20 miles in overdrive (that's a lot less wear) not to mention the fuel savings and longer range. There is a lot less engine noise in overdrive also. We have included a frequently ask questions section that may answer some of your questions, don't see answers you need, just give us a call we will be happy to review your application with you. The following links provide specific application information, performance data that you can expect and the price data for your specific vehicle. Below you will find an extensive section of free information, data, application charts and installation instructions information articles includes troubleshooting tips, information that allows you to review installation instructions before your purchase: You can find answers to what domestic or import automatic transmission do I have in my vehicle? What Ford, Jeep or Dakota manual transmission is in my vehicle, Jeep transmission size and ratio look-up table. How to install a T56 six speed manual transmission in a Ford or GM Chevrolet. Understanding & avoiding clutch failures and clutch troubleshooting diagnostic guide. What Rear End Ratio do I have in my Chevrolet or Ford do I have a Positraction differential? Ring Gear and Pinion Installation Instructions also presented in Spanish "Instructciónes Para Cunstruiando Diferenciales y Corona Piñón". An article on Differentials - What's the Difference, how they work, How to select ring and pinion ratio is provided in a Gear Ratio Guide for Larger Tires. Information is provide to assist you with driveline drive shaft problems are covered in Drive Shaft field problems, angle problems and troubleshooting tips. Installation information is provided on Ford diesel 7.3lt power programmers, turbo down pipes. Three articles are provided for installation of positration units include: no-Slip Positraction Installation Instructions, LockRight Positraction Installation Instructions, Toyota TRD Positraction Installation Instructions. You can also read an article on how to install Warn locking hubs. Need Help, or just want information. Allows you to review installation instructions before your purchase. What Jeep or Dakota manual transmission is in my vehicle? What manual transmission ratios is in my Jeep? What manual transmission fluid should I use? What Rear End Ratio Do I have Do I Have Positraction? Differentials - What's the Difference? Simple return and warranty policy Recommended Vendors Checkout our picture page of High Performance Vehicles. "Tired of a dead battery, New Dry Cell Technology provides 3 times the life and 60% more Cranking Power"
The combination of extreme power and performance makes ODYSSEY® batteries perfect for a range of applications, including auto/LTV, marine, commercial, racing and powersports. ODYSSEY batteries deliver twice the overall power and three times the life of conventional batteries! Below information is presented show how this design revolution makes performance possible! The Odyssey battery ingeniously uses absorbed glass mat (AGM) technology to offer, in onebox, the characteristics of two separate batteries. It can deep cycle as well as provide enormous cranking power. These batteries are capable of providing engine cranking pulses in excess of 2250A for 5 seconds as well as 400 charge/discharge cycles to 80% depth of discharge (DOD). A typical starting, lighting and ignition (SLI) battery can do one or the other, but not both. Odyssey AGM batteries will doboth - provide short duration high amperage pulse or low rate long duration drains. We offer a full line of batteries, charges and accessories. Extreme Power combined with Indestructibility! No wasted space, equals more efficiency, Better Performance! Some batteries provide enormous cranking power. Others, deep cycle reserve power. The revolutionary ODYSSEY™ battery is designed to do both. In fact, ODYSSEY batteries are capable of providing engine cranking pulses in excess of 2250 amps for 5 seconds - double to triple that of conventional batteries, even at very low temperatures. And they can handle 400 charge-discharge cycles to 80% depth of discharge. The extreme combination of power and performance makes ODYSSEY batteries perfect for a range of applications, including automotive/LTV, marine, commercial, and powersports. Thanks to rugged construction and AGM (Absorbed Glass Mat) design, ODYSSEY™ batteries have an 8-12 year design life and a 3-10 year service life. Welded internal cells enable it to withstand extreme vibration, and AGM design holds acid in place to prevent spills, even when installed on its side. And unlike conventional batteries, ODYSSEY batteries can be stored for up to 2 years and still be returned to full power. Pure Lead Plates: Constructed from 99.99% pure virgin lead, ODYSSEY battery plates are extremely thin, so more of them can fit into the battery. More lead plates equals more power. Tin Alloy Coated Brass Terminals: Brass terminals coated with a high quality tin alloy ensure secure, corrosion-free cable connections. Compressed AGM Plate Separators: Before being inserted into the case, the Absorbed Glass Mat plate separators are compressed by 28% for extreme vibration resistance. assured of fast charge recovery. The ODYSSEY battery may be installed in any orientation (except inverted) without sacrificing any performance attributes. There is no fear of any acid spillage as ODYSSEY batteries recycle the internal gas during operation or charging. The valve regulated design of the ODYSSEY battery eliminates the need for an acid vent tube; eliminating the fear of acid burns or damage to expensive chrome or paint. ODYSSEY batteries are shipped fully charged. If the ODYSSEY battery's voltage is 12.65V or greater, simply install the battery in your vehicle and you are ready to go! If below 12.65V, boost charge following the instructions in the ODYSSEY battery Owner’s Manual and/or Technical Manual. Putting a boost on the battery will not damage it, even if its voltage reads higher than 12.65V. Unlike conventional batteries that require a recharge every six to twelve weeks, the ODYSSEY battery can be stored for up to two years at 25ºC (77ºF) from a fully charged state. These batteries can be stored for two years or when the open circuit voltage (OCV) drops to 12.00V, whichever comes first. Should the ODYSSEY battery become deeply discharged, simply recharge following instructions in this manual. We offer a series of accessories that will enhance your vehicle performance, our gauge kits allow you to monitor engine, transmission and differential temp and improve appearance. Larger automatic transmision pans and larger differential covers increasing fluid capacity and will extend life of components extend maintenance intervals by allow the transmission or differential to run at lower temperatures. We offer new silicon engine hose kits to upgrade and replace existing hoses on Dodge Cummins Diesels. In addition we offer posi-lock kits to replace vacumm lock, this front differential control upgrade kit is available for most applications. Need help with you speedo, just let us know we offer speedo electronic adjustment kits. Performance Vehicle Album, send us a photo of your ride and brief description and we will post and share it!